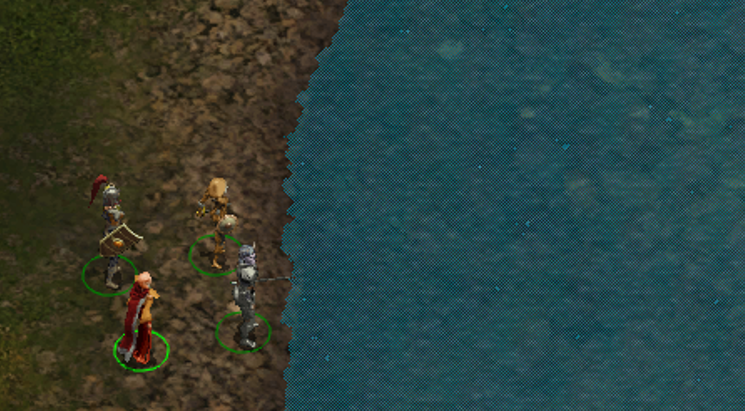 Does anyone else find the water at Adoy's Enclave looks strange, compared to other areas? Daytime, it looks kind of like an out-of-tune TV screen, with dead pixels. At night the dead pixels are gone, but the water is completely opaque: no riverbed. It's on the PC version too. The problem is a buggered daytime overlay - it's been logged as a bug but regretably it was still WNF last time I looked. The riverbed is there at night but is darkened down; the result is correct in that as in the real world, you can't see it. The day and night water texture is the same. I have this on my to-fix list, when (if) I get the tools. Don't hold your breath. Ah, I figured it would be probably already reported, but I hadn't found the bug report. Thanks for filling me in!